Home » Issues » Summer 2012 » Who Values Education? WE DO! I am reading a lot of criticisms of higher education. People are saying that student debt is too high, that colleges cost too much, and that the liberal arts are a waste of time. What is behind all of this criticism? One of the things that unites these criticisms is the view that the value of an education is to be determined primarily by comparing the student’s cost to his or her future earnings. We no longer spend much time thinking about the relationship between an educated citizenry and a strong democracy or a growing economy. For a long time, higher education was understood as the underlying secret to American progress and to the promise of a society in which there is social mobility, a society in which your future is determined by your effort and not by the economic status of your parents. This meant that Americans assumed that individual students and families would not be asked to shoulder the full financial burden of educating their children. So we have public institution where citizens collectively provide for the education of young people. And we have the education model like ours in which the education of an individual is subsidized by grants and gifts from private individuals who believe in the mission of the institution and believe in its students. But increasingly, education in this country is being viewed not as a societal good or promise, but as an individual good. We are seeing dramatic underfunding of public education at every level, for example, and a renewed emphasis on the cash value to the student of a degree. Individual families are being asked to bear more and more of the cost— often requiring significant debt—and the worth of that investment is measured in individual terms. 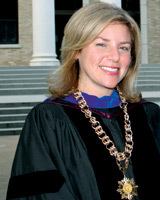 What effect is this public dialogue having on Austin College? The reduction of public support (Pell Grant and Tuition Equalization Grant funding cuts as well as sharply increased interest rates and origination fees for student loan programs) is directly affecting our students. Austin College has a longstanding commitment to access, which means that we do our very best to keep our doors open to students from a range of financial and social backgrounds. Twenty-five percent of our students are Pell grant eligible; we enroll 30 percent “students of color” and many, many first-generation college students. We are able to do this by making financial aid and scholarships a top priority. Austin College currently returns more than 52 cents of every tuition dollar received in the form of financial aid to students. But reductions in public support, coupled with strains on family budgets (for both our students and our donors), mean that access is increasingly at risk. It is heartbreaking to talk to families who absolutely understand the value of an Austin College education—but simply cannot pay for it. How is Austin College responding to these concerns? We can’t afford to approach this issue with an air of defensiveness or knee-jerk platitudes about the value of the liberal arts. There are legitimate critics of “business as usual” in higher education, and we would be foolish not to learn from those. We are working hard to contain costs without sacrificing educational quality. This is a challenge because there is no evidence yet that radically lower cost alternatives can produce the kind of results that we produce at Austin College. One can certainly offer a cheaper education, an education that is more mass-produced, an education that does not foster individual development, an education that is based on the passive reception of information rather than the act of collaboration between faculty member and student. We see models of this all the time. But there is no evidence—and in fact there is evidence to the contrary—that those forms of education are successful in producing results. If you look at outcomes, the sector that has the highest graduation rates is the private liberal arts college. The sector with the highest rates of success for students from reduced circumstances is the private liberal arts college. The sector that goes on to produce the most Ph.D. graduates and the most leaders in a wide range of fields is the private liberal arts college. Finally, we have learned that we must be ever more focused on measuring the outcomes of an Austin College education. We know in our hearts and souls that Austin College prepares students for lives of leadership, lives of service, lives of productive, flourishing careers—but that knowledge must be translated into real data collection and real measurement. We need to make sure, of course, that we are not simply measuring facile things. It isn’t just the salaries of our graduates that we consider; we need to have a broader understanding of life’s satisfactions and communal contributions and of the contributions our graduates make to society. What are the outcomes we want for our students? The promise of low-cost alternatives is that they can provide information to students in a mass and inexpensive way—and there is absolute truth to that. There may be some things for us to learn from that, even in our sector, in our way of providing an education. But these skills that we know are so essential to an Austin College education require a much more interactive and individual approach than we see provided in these lower cost alternatives. We expect an Austin College education to produce intellectual and practical skills of inquiry and analysis, critical and creative thinking, written and oral communication, quantitative literacy, information literacy, and teamwork and problem solving. But we also promote skills in personal and social responsibility, including local and global civic knowledge and engagement, intercultural knowledge and competence, and ethical reasoning and action, as well as foundations for lifelong learning. We want our students to be able to apply those skills in ever changing situations to address complex problems. We believe the type of education offered by Austin College provides much better outcomes than other options. However, this does not mean that we can be complacent. We are going to need to be creative and energetic in seeking ways to ensure access to a high quality liberal arts education. It is going to take every one of us working together to do that. There will not be easy answers, and it is not going to be business-as usual for colleges like ours. We will have to be more creative and more flexible than we have had to be in the last 50 years in understanding how we can best respond to this change in climate. As a private institution, no one is going to bail us out. It is up to the ’Roo Nation, and each of us will have to collectively find ways to ensure that Austin College’s twin traditions of excellence and access are not compromised. 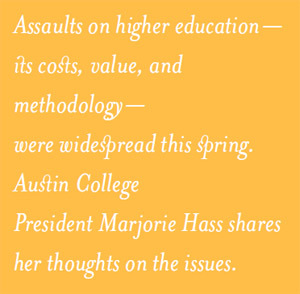 1″Raising the Bar: Employers’ Views on College Learning in the Wake of the Economic Downturn.” January, 2010, by the Association of American Colleges and Universities.